Marvel Comics is releasing its solicitations for January at noon (ET) on Monday. Check back here in The Continuum then for a complete rundown. 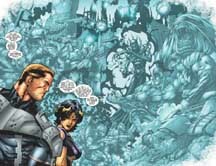 Image Comics has released its solicitation information for January. Ben Edlund, creator of The Tick, wrote this Wednesday's episode of Angel, "Life of the Partry," on The WB. "The consummate entertainer Lorne (Andy Hallett) works around the clock to throw the ultimate Halloween party at Wolfram & Hart. When their guests begin to behave strangely and out of character, Angel (David Boreanaz) and the gang investigate to find out what's causing the mysterious happenings." The episode was directed by Bill Norton. The Wednesday, Nov. 5 episode of Angel is "The Cautionary Tale of Numero Cinco." "Angel learns that he must track down a retired Mexican wrestler (guest star Danny Mora) to help him defeat Tezcatcatl, an ancient Aztec warrior who emerges every 50 years to take the heart of a hero to sustain his own existence. Angel is surprised to find the wrestler is employed at his company, Wolfram & Hart, and that he has a personal score to settle with Tezcatcatl." CrossGen Entertainment on Friday released covers and pages from three comics shipping next week that will be "crucial" to the upcoming The War event. *Mystic #41, written by Tony Bedard, penciled by Aaron Lopresti, inked by Matt Ryan and colored by Wil Quintana. *Crux #30, written by Chuck Dixon, penciled by Sergio Cariello, inked by Rob Hunter and colored by Laura Villari. "Atlantis vs. the Negation -- it's all-out war. 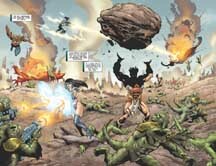 The newly reinforced Atlanteans collide with the endless hordes of Negation amphibian monsters...and to the victor goes Earth itself." *Sigil #41, written by Chuck Dixon, penciled by Dale Eaglesham, inked by Andrew Hennessy and colored by Andrew Crossley. "Emergency evacuation! When Sam reunites with Zanni on her home world of Delassia, it should be a happy day, right? So how come no one is smiling? Maybe it's because Sam is forcing the planet's population to flee! So why is he doing this -- and what is Zanni's secret? Plus: the return of Trouble!" 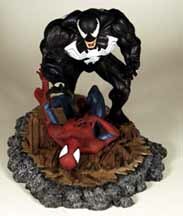 Here's a first look at the Spider-Man/Venom Diorama Statue and the Mystique Bust from Dynamic Forces. Both will be available early next year. Coming Monday: Marvel news -- and much more!!! * For Monday, Oct. 20, including Star Wars and Halle Berry news, CLICK HERE. * For Saturday, Oct. 18, including Punisher movie news, CLICK HERE. * For Friday, Oct. 17, including X-Men: Evolution news, CLICK HERE. * For Thursday, Oct. 16, including Punisher movie news, CLICK HERE. * For Wednesday, Oct. 15, including Punisher movie news, CLICK HERE. * For Monday, Oct. 13, including Hulk and Punisher movie news, CLICK HERE. * For Saturday, Oct. 11, including Angel news, CLICK HERE. * For Friday, Oct. 10, including Dark Horse's solicitations, CLICK HERE. * For Thursday, Oct. 9, including Avengers news, CLICK HERE. * For Wednesday, Oct. 8, including X-Men: Evolution news, CLICK HERE. * For Tuesday, Oct. 7, CLICK HERE. * For Monday, Oct. 6, CLICK HERE. 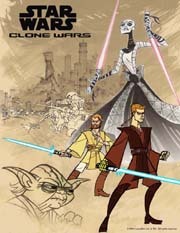 * For Saturday, Oct. 4, including Star Wars news, CLICK HERE. * For Friday, Sept. 19, Mutant X news, CLICK HERE.